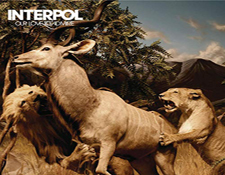 At the end of 2017 I reviewed the 10th Anniversary CD reissue of Interpol's hit album Our Love To Admire with mixed results (click here to read it). I really wanted to review the album from an LP source but samples were not made available to the press (at least that is what I was told when I asked). And, since most places I saw the album being sold in at the time were asking nearly forty dollars, I decided to take a pass on it and just worked with the CD. Well, the price on this album seems to have come down a good 25-percent and I had some store credit to use at a favorite shop so I figured I'd check it out. And while I was at it, I checked in on Tidal, finding the album now streaming there in 24-bit, 88 kHz resolution. 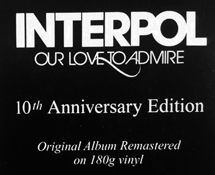 In general the Tidal stream for the high resolution version of Our Love To Admire sounds pretty solid with nice amplifier tones coming through on tracks like "The Scale" and "Pace Is The Trick." "Wrecking Ball" also has a nice sense of room ambiance coming through on the introductory solo electric guitar parts (that is a production /compositional convention this band seems to play with a lot); I do recognize this might well be a reverb effect applied afterwards (many producers record parts "dry" and apply the effects afterwards in mixing which gives them more control over the sound ultimately). You don't hear as much of this detailing on the 16-bit, 44.1 kHz CD quality stream. If I have any problem with streaming this recording it is the gnawing digital edge I hear around singer Paul Banks' voice. It makes it less comfortable to listen to him at louder volumes even with this higher resolution presentation. Curiously, while this element comes through on the vinyl pressing, it is not as in your face. The bass and midrange sounds warmer on this pressing than on the purely digital stream so the net effect is more appealing. 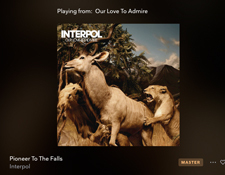 Listening back and forth between Tidal and the LP on the first song -- "Pioneer To The Falls" -- when the drums and bass kick after the moody solo intro, the overall presentation of this music is far stronger on the LP. It feels more like a band and less like disparate tracks playing in a digital mix. Perhaps this effect is achieved by a certain extra tightening compression of the mix for the LP's disc mastering (guessing here but it stands to reason...). The kick drum hits are punchier and the overall vibe of the music is tighter and more enjoyable on the vinyl than the purely digital presentation. I admit this may also be an effect of this music being run through my trusty Bellari tube pre-amplifier. It really sounds amazing when the final snare drum march ends the song. "The Heinrich Maneuver" rocks madly on this pressing while the Tidal stream is bright and overly crispy, losing much of the midrange warmth. My pressing seems to be pretty well centered -- its not perfect -- but not displaying any negative impact on the music. The thick black 180-gram vinyl is dark and quiet. No complaints there. Wow... I'm finally pretty happy with an Interpol album on vinyl!